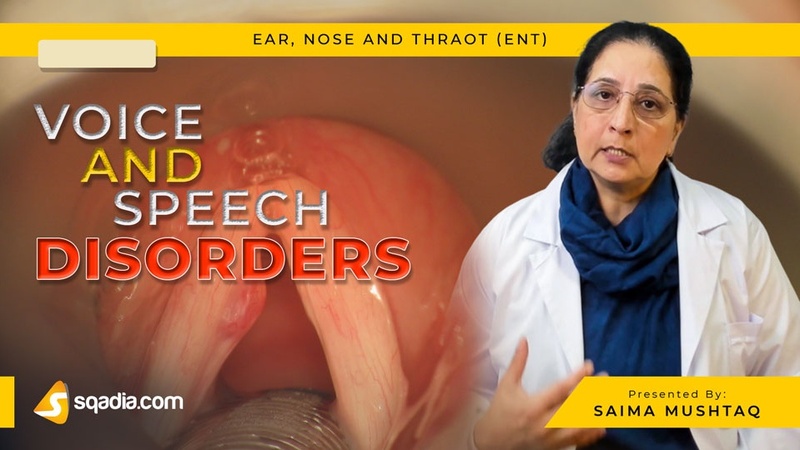 This sqadia.com medical video lecture comprehensively touches all aspects of voice and speech disorders. Initially, hoarseness is elaborated. 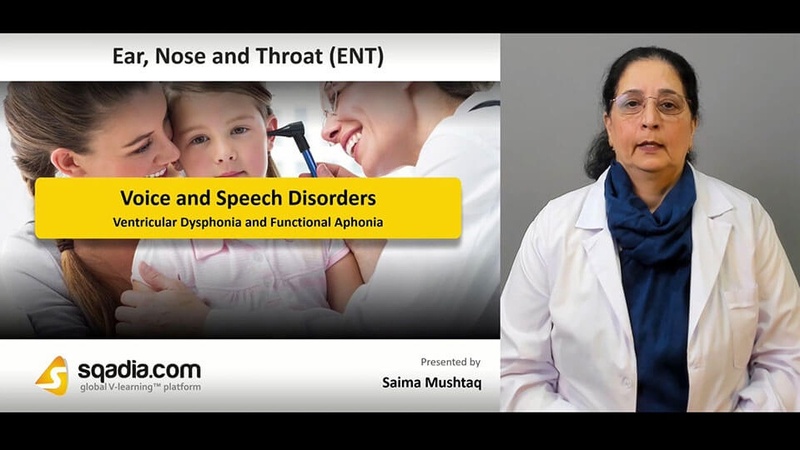 Then ventricular dysphonia and functional aphonia along with puberphonia and phonasthenia comes under consideration. Types of dysphonia are also enlightened. 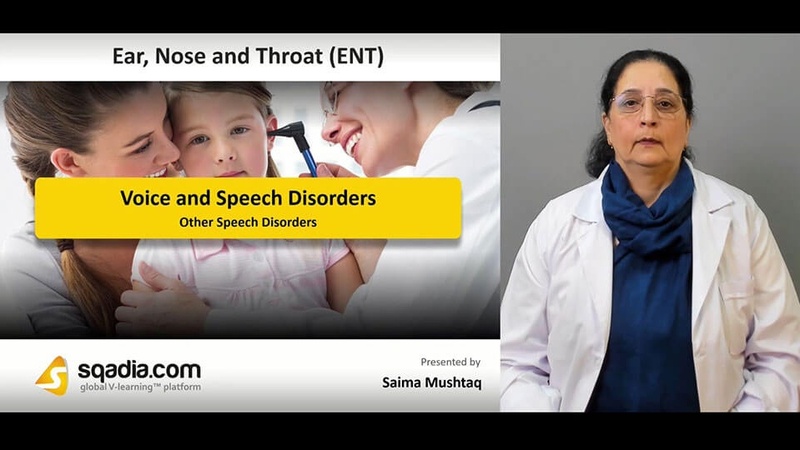 Dr. Saima Mushtaq also talks about other speech disorders which include hyponasality, hypernasality, and stuttering. Hoarseness is defined as roughness of voice resulting from variations of periodicity of consecutive sound waves. important factors to be considered involve Loss of approximation, Size of the cord, and stiffness. Dr. Saima Mushtaq elaborates the aetiology of hoarseness in detail in her sqadia.com V-learning lecture. Then information about investigation is delivered in which after taking history, examination is carried out by laryngoscopy, microlaryngo-scopy, bronchoscopy, and oesophago-scopy. In dysphonia plica ventricularis also known as ventricular dysphonia, voice is produced by false ventricular folds. In this condition voice becomes rough and low pitched. Its treatment is difficult but can be managed through voice therapy and psychological counselling. Another condition discussed in this section is functional aphonia. Our medical specialist explains that in this condition vocal cords are in abducted position. In this section puberphonia is discussed which is also known as mutational falsetto voice. Treatment of this disorder corresponds the training to produce low-pitched voice. Besides this, Dr. Saima Mushtaq also highlights phonasthenia. It is weakness of voice due to fatigue of phonatory muscles. For treatment of phonasthenia, vocal rest, vocal hygiene, and periods of voice rest after excessive use of voice is advised. Adductor, Abductor, and Mixed dysphonia are the three types of dysphonia. In adductor dysphonia, adductor muscles of larynx go into spasm. Treatment and aetiology is also discussed in detail by the medical specialist at sqadia.com. Next is the abductor dysphonia. It is due to spasms of posterior cricoarytenoid muscle. Botulinum toxin injection are used for its treatment along with other treatment options. Lastly, information about mixed dysphonia is delivered. Hyponasality is the other name of rhinolalia clausa which arises due to blockage of nose or nasopharynx. After discussing the causes of hyponasality, Dr. Saima Mushtaq moves to talk about hypernasality. Among the various causes of hypernasality, some include large nasopharynx, soft palate paralysis, oronasal fistula. for detailed information watch the full lecture on sqadia.com. Furthermore, light is shed on stuttering.